You’re planning a writing retreat for teachers at your writing project site. You’ve put together the schedule, with time for writing and responding to writing. You’re providing comfortable, inviting nooks in which to write, as well as good food. It’s a retreat worthy of William Shakespeare. But imagine this scenario: a modern-day Will shows up at the retreat planning to access recently updated information on a podcast website as background for his article about his students’ podcasts. Have you considered the needs of your teacher-writers with respect to technology? At sessions of the National Writing Project Writing and Technology: A Professional Writing Retreat (WAT), held three times in Nebraska from 2005 through 2007, the other facilitators and I experienced how teachers use technology in their writing and thinking—from basic word processing on their laptops to blogging, from digital stories to graphic novels. We learned how technology inspired, structured—and, yes, occasionally hampered—writing. From these experiences, we’ve gleaned insights that others may find helpful in planning a writing retreat. As we discovered in leading the WAT retreat, you don’t have to be a technology expert to help teachers make appropriate use of technology. In fact, it’s impossible for one person to keep up with all the new and evolving forms in the field. But as writing project educators we are used to working with teachers from a variety of subject areas and grade levels. When a teacher comes to a writing retreat to develop an article about using writing in a ninth grade biology class or a first grade class, we don’t pretend to be experts on biology or first-graders. The same is true when technology enters the picture. The facilitators may not be experts but they’ve probably used email and the Internet. They may even have tried a blog or participated in an online chat. That’s more than enough experience with technology to be able to help these teacher-writers in meaningful ways. What we know as writers and teachers of writing still applies when responding to writing with a strong technology emphasis. For example, at the 2007 WAT retreat, I observed with fascination a teacher-writer named Belinda (Bee) Foster, from the Area 3 Writing Project in California, who was composing a graphic-novel memoir, intended to be a resource for other teachers to think through issues of identity and race in the classroom. Bee created drawings for her graphic novel, mostly by tracing family photographs; she then scanned the drawings and saved them on her computer so that she could insert them into her Word document. Before she arrived at the retreat, she had also built a font from scratch, based on her own handwriting, to use with her drawings. In comic/cartoon form, panel by panel, she inserted her drawings, as well as captions and balloons containing her “handwritten” words, fleshing out her narrative about how she became a teacher. My experience of being both a bi-racial/gay student and an educator is one which needs to be told. I have been forced to make decisions that most students and educators don’t have to make. I feel the graphic novel medium is perfect. To provide images of a world not everyone can understand invites the readers to step into the pages with their eyes and allows their hearts to then follow. Equity is not about changing personal opinions; it is about allowing every student, every educator, the respect and safety to be themselves despite personal opinions. Bee’s explanation about why she had chosen the graphic novel as her medium for composition is both logical and inspired. Bee felt strongly that this hybrid medium containing both images and text would allow her to compose while providing the reader with an inviting way to enter into her story. Clearly, Bee didn’t pick the graphic novel at random. As a reader, I found her work vivid and personal, both complex and accessible. At the same time, in offering feedback, I didn’t have to be knowledgeable about how she created her font or put together her piece. It was helpful that I’d read graphic novels, but I was not any kind of expert. I responded to the work, primarily, as I had to other forms of writing, focusing on the narrative flow itself and how Bee’s story addressed her audience and purpose. After all, we were still talking about a narrative with voice, description, and dialogue, all aspects of writing with which most teachers of writing are familiar. At a technology writing retreat some participants are likely to write about the medium itself. For instance, they might write about the importance of online social networking—educators and students interacting with one another online in blogs and other social networking forms. They might write about how students who struggle with writing traditional essays often find they are able to write—or, more accurately, compose—more easily when constructing digital stories, blogging, or podcasting, and how teachers can use those technologies to help them develop their ideas and do research for traditional essays. Other participants may describe the benefit to educators of writing in these nontraditional media. One teacher-blogger explained, “Reading and writing with blogs is a great way to get new ideas and consider how to fit them into my own practice” (Eden 2007), while another noted that she gets “a sense of validation that [she is] . . . growing as a teacher and [has] . . . something to say to other teachers—and that they care to listen!” (Hogan 2007). The medium also affects how participants compose pieces at a retreat. Most of our retreat writers brought their own laptops, choosing to work in a word processing program such as Microsoft Word. But other possibilities that might better fit the writer’s focus, purpose, and audience open up. For instance, what if a writer is composing digital stories about what she learned in the classroom? She can use pictures and recordings of students writing and working in small groups, and as the narrator she can explain and reflect on the images of the digital story and embed appropriate passages of music and floating text. All this, and more, is possible in composing a digital story. In planning the WAT retreats, we recognized that having retreat participants respond to a digital story or another piece composed in a nontraditional mode required careful thinking and preparation on our part. Providing a document that includes this approach to response and consciously changing the wording in the document to embrace multiple modes of composition helped the small groups understand how they might respond to each other’s work. A discussion of this document at the retreat, along with examples of different modes of composition, helped to prepare them further. 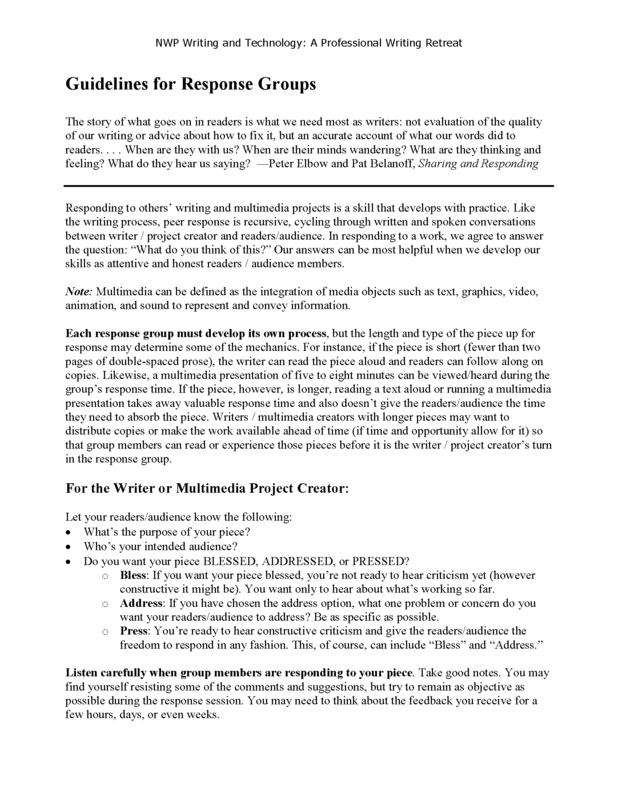 Of course, in asking people to share their writing in the small groups and discuss the medium, we also encouraged them to talk about the purpose and the audience for their pieces, aspects of writing that remain critically important no matter what medium they have chosen. We noted that response groups at WAT tended to make use of the tools of technology as they responded. In some instances, people were looking at computer screens rather than printed sheets of paper. Some groups chose to use Google Docs for sharing and commenting on pieces online. One team wrote and revised collaboratively in Google Docs. Sometimes the groups emailed their documents to each other so as to insert comments using Word’s comment feature. While the beginnings of Bee Foster’s graphic novel could be printed and read on paper, she did email her document to others for feedback. The guidelines we had provided gave her small group a way to respond meaningfully to her work, as the guidelines take into account how a nontraditional genre such as the graphic novel might require a different kind of response. For many retreat participants a computer, a communal printer, and maybe a flash drive will be all they will need to get started. But others may need frequent and immediate use of the Internet. One teacher-writer explained that she composes best by having access to the Internet as she writes in Microsoft Word. She alternates between typing in her Word screen and looking at comments she and colleagues posted on a blog that pertain to her topic, between examining the online project that her students created and consulting the online wiki where she and other teachers posted a list of useful websites, between sending instant messages back and forth with a colleague across the country who is doing research on a related topic and digging for new sources in an online library database. She is what we might describe as a “wired” teacher-writer. She is not alone; other teachers are operating in similar ways. That’s why, at technology retreats in particular, we need to do our best to make Web access available. Participants should be queried in advance as to the technical support they will need as they work and be informed of the options that will be available. And there’s another way in which a technology writing retreat differs from its more generic cousin. As we also discovered during the first year of the WAT retreat, participants needed more time to develop their pieces. This is true because many participants need to focus first on composing a planning document before they commenced with the actual execution of the piece. For example, Bryan Salagovic from the Southern Colorado Writing Project spent most of his time at the retreat working on a storyboard instead of the actual digital story (movie) itself, which he developed after the retreat. Learning of this need for additional time, we built an extra day in to the second and third years of the retreat. What Should You Do When the Course of Technology Does Not Run Smooth? We’ve all experienced technology challenges, from an Internet connection failing when we need it most to a data projector that will not cooperate when we attempt to show something to a large group. We faced technology challenges at the WAT retreat, too, including printer malfunctions, computers crashing, and teachers struggling with some aspect of a computer program they were using. Does this mean that we needed to be not only writing retreat leaders but technology gurus as well? In a word: no. Our WAT retreat participants were informed that this was not a technology institute where they would learn about technology or get extensive assistance with technology. We told them that they needed to be knowledgeable about whatever technology they were planning to use at the retreat. This helped to keep both the participants and facilitators focused on writing at the retreat. And when the technology sometimes failed, we came up with work-arounds. For example, when one retreat participant’s laptop crashed, we had an extra one on hand. When another participant struggled with a computer application, one of the facilitators worked with the participant to think through the problem and solve it. When technology failed we asked ourselves How can we help this writer to start writing or composing again? What changes can be made so that the writer can do the work he or she intended to do at the retreat? Answering these questions led to solutions to whatever challenges—technology-related or otherwise—might occur, so that teacher-writers were able to compose such stuff as dreams are made of. Our Remedies Oft in Ourselves do Lie: The Anthology Goes Digital. After a writing retreat ends, typically, the participants share their writings with their colleagues in an anthology even if the pieces are unfinished. While some of these pieces may not end up getting published in a traditional venue such as a professional, peer-reviewed journal, including them in an anthology that all of the retreat participants can read and enjoy has value in itself. However, the cost of paper anthologies and postage can be prohibitive. What’s more, writers who create digital works—in the form of a digital story or podcast, for example—will not be part of the paper anthology—although they could be included if, for example, a CD of their work is attached to the paper anthology or a page in the anthology states the Web addresses for their online work. But other possibilities have opened up. Participants’ work can be placed on a CD (without a paper version) or online, on a blog, wiki, or social networking site. Regardless of the form an anthology takes, writers who anticipate publishing their work elsewhere can be protected by an embedded statement that the anthology is intended only for private distribution, not publication. And if the anthology is an electronic one, this privacy can be protected by a password. Some blog systems like Blogger.com or social networking sites like Ning.com allow this option. We also wanted to help our writers move to the next step beyond the anthology. We brainstormed with them the expanding ways in which they might publish their work, including. print and online journals, but also outlets such as their own blogs or websites, or print and online publications generated by their local writing project sites.